During the contentious 1982 murder trial of Philadelphia radio-journalist Mumia Abu-Jamal, a central argument of the prosecution in making its case for the conviction and for imposition of a death penalty was the trial testimony of two key eyewitnesses who claimed to have actually seen Abu-Jamal fire his pistol repeatedly, at virtually point-blank range, into the prone Officer Daniel Faulkner. This testimony about Abu-Jamal’s shooting at the defenseless policeman execution-style solidified the prosecution’s portrayal of Abu-Jamal as a cold-blooded assassin. There was, however, always the lingering question, never raised at trial or even during the subsequent nearly three-decades-long appeals process, of why, if Abu-Jamal had fired four bullets downward at Faulkner, only hitting him once with a bullet between the eyes on the morning of Dec. 9, 1981, there was no evidence in the surface of the sidewalk around the officer’s body of the bullets that missed. Now two independent journalists have raised further questions about that troubling lack of any evidence of missed shots by doing something that neither defense nor prosecution ever bothered to do, namely conducting a gun test using a similar gun and similar bullets fired from a similar distance into a slab of old concrete sidewalk similar to the sidewalk at the scene of the original shooting on the south side of Locust Street just east of 13th Street in Center City, Philadelphia. Their test conclusively demonstrated it is impossible to fire such a gun from a standing position into a sidewalk without the bullets leaving prominent, unambiguous and clearly visible marks. Yet, the prosecution’s case has Abu-Jamal performing that exact miracle, missing the officer three times without leaving a trace of his bad marksmanship. So where are the missing bullet marks? The police crime-scene photos presented by the prosecution don’t show any, and police investigators in their reports don’t mention any bullet marks on the sidewalk around the slain officer’s body. The results of this test fundamentally challenge the prosecution’s entire case against Abu-Jamal since they contradict both eyewitness testimony and physical evidence presented by the prosecution about the 1981 murder of Officer Faulkner in a seedy section of downtown Philadelphia. Further, this test reignites questions about how police handled and/or mishandled their investigation into the murder of Officer Faulkner, quickly targeting Abu-Jamal as the killer. For example, police failed to administer the routine gunpowder residue test on Abu-Jamal’s hands to determine if he had recently fired a gun. Such a test has long been standard procedure for crimes involving gunshots. Oddly, police did perform this routine residue test on at least two persons initially suspected of being at the crime scene, including one man who fit the description of a man numerous eyewitnesses told police had shot Faulkner and then fled the scene. Police, finding a critically-wounded Abu-Jamal at the crime scene, arrested him immediately, but never bothered to do a test of his hands – or, if they did, never reported the results. For their experiment, veteran Philadelphia journalist Linn Washington, who has investigated the Abu-Jamal case since December 1981, obtained a Smith & Wesson revolver with a 2-inch barrel, similar to the 2-inch-barrel, .38-caliber Charter Arms revolver licensed to Abu-Jamal, which was marked as evidence at the trial as being the weapon which was used to shoot and kill Officer Faulkner. Meanwhile, journalist Dave Lindorff, who spent two years researching and writing “Killing Time” (Common Courage Press, 2003), the definitive independent book about this case, procured the concrete test slab, a 200-pound section of old sidewalk, about two feet square, five inches thick and containing a mix of gravel and a steel-reinforcing screen, that had recently been ripped up during construction of a new high school in Upper Dublin, PA. He then constructed a protective shield using a wooden frame and a section of galvanized, corrugated-steel roofing material purchased from Home Depot. A small 1-inch-diameter hole was drilled through the steel sheet about 18 inches from ground level, to enable Washington to point the pistol barrel through and fire at the concrete without risk of being injured by flying shrapnel or concrete fragments. Washington also wore shatter-proof military-surplus goggles for the experiment, so he could safely aim through the hole. During the test a total of seven bullets, including Plus-P high-velocity projectiles similar to the spent cartridges police reported finding in Abu-Jamal’s gun, were fired downward at the sidewalk slab from a standing position, replicating the prosecution’s version of the murder. 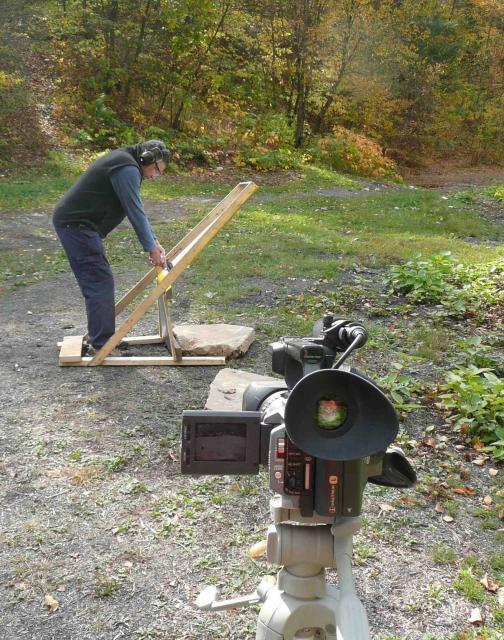 A Penn State history professor knowledgeable about firearms and ballistics, including the construction of bullets, observed the experiment from start to finish. After each shot was fired into the concrete, the resulting impact point was labeled with a felt-tipped pen. Still photographs were taken showing all seven bullet impacts. The entire experiment was also filmed using a broadcast-quality video camera. What is clear from this experiment is that the bullets fired at close range into the sidewalk sample all left clearly visible marks. The three bullets that had metal jackets produced significant divots in the concrete, one of these about 1/8 of an inch deep, and two that were shallower but easily observed visually and easily felt with the fingertip. 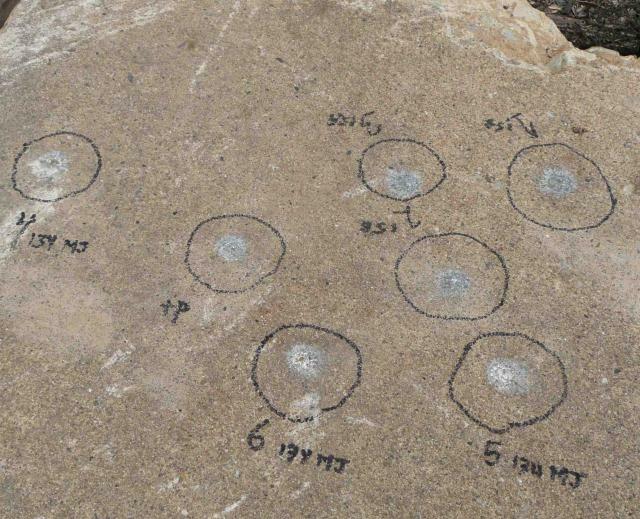 The other four bullets, lead projectiles only, left smaller indentations, as well as clearly visible gray circular imprints, each over a half inch in diameter, where the lead from the bullets appears to have melted on impact and then solidified on the concrete. Police crime scene reports list investigators recovering fragments of at least two jacketed bullets at the scene (Faulkner’s police-issue Smith & Wesson revolver was firing non-jacketed ammunition). When a photo image of these seven prominent impact sites from the bullets is compared to detailed police crime-scene photos, the absence of similar such marks at the crime scene is obvious. Even the higher-quality photos of the shooting scene that were taken by Pedro Polokoff, a professional news photographer who arrived at the shooting scene within 20 minutes of hearing about it on his police radio scanner – well ahead of the police photographer and crime-scene investigation technicians – show no bullet marks. If there are no bullet marks around the spot where Faulkner was lying when he was shot in the face, neither of these testimonies by the two prosecution witnesses is remotely credible. And there is another question. 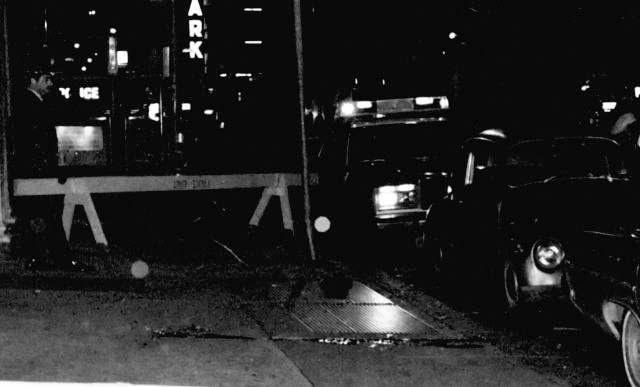 When the protective steel sheet was checked after this gun test, there were deep dents in the metal which were produced by either concrete fragments blown out of the sidewalk or by bullet fragments. Such debris, large and small, would have been embedded in Faulkner’s uniform and/or in exposed skin, such as the sides of his head, or underneath his clothes, and yet the coroner’s report and a report on the analysis of his police jacket make no mention of concrete, rock or bullet fragments. One can additionally speculate about why, if there were in fact bullet marks in the sidewalk, police investigators at the scene never identified and marked them off with chalk, and never photographed them, as would be standard procedure in any shooting, not to mention a shooting death of a policeman. Even more curious, investigators did note and even removed as possible evidence a bullet fragment found in a door jamb well behind Faulkner’s fallen body, as well as gathering up three other minute bullet fragments. These actions show that on the morning of the 1981 shooting investigators were combing the crime scene looking for evidence of bullets. Had there been impact marks in the vicinity of where Faulkner’s body was lying, they would surely have noticed them and marked them for evidence. “When one shoots a bullet into solid concrete, the concrete shatters at the impact point and creates a lot of scattering surfaces. It contains many micro-cracks that scatter the light more and make the impact area appear to be more reflective. This is apparent in the white circular areas in the test image. Dr. Michael Schiffmann, a University of Heidelberg professor and author of “Wettlauf gegen den Tod. Mumia Abu-Jamal: ein schwarzer Revolutionär im weißen Amerika” (Promedia, Vienna, 2006), a detailed book about Abu-Jamal released in Europe, questioned a number of experts about the missing bullet marks, including the longtime head of ballistics in the medical examiner’s office in Tübingen, Germany. This medical examiner told Schiffmann that the notion that police investigators might have somehow overlooked the bullet impact sites around Faulkner’s body or might have failed to recognize them as bullet marks is “absolute nonsense.” That medical examiner says the marks would have been evident and identifiable as being caused by bullet impacts even if Faulkner’s blood had flowed over them. There are, moreover, other good reasons to doubt that White and Chobert were telling the truth, or even that either one of them was actually a witness to the shooting. Chobert claimed at trial to have pulled his taxi up directly behind Officer Faulkner’s squad car, which itself was parked directly behind the Volkswagen Beetle owned by Abu-Jamal’s younger brother, William Cook, whom Faulkner had supposedly stopped for a traffic violation. Though the trial judge, Albert Sabo, withheld this information from the jury, Chobert at the time of the shooting admitted to the court that he was driving his cab illegally on a license that had been suspended following a DUI conviction. He was also serving five years probation for the crime of felony arson of an elementary school. Under such circumstances, one has to ask if such a driver would have deliberately parked his cab behind a police vehicle, where there was a risk he could have been questioned, arrested by the officer and possibly even jailed for violating conditions of his probation. In any event, there also are no crime-scene photos that depict a taxi parked behind Faulkner’s squad car. Indeed, the official police crime photos, as well as those taken even earlier by Polokoff, show no taxi behind Faulkner’s car. Chobert’s cab’s absence from crime scene photos raises an inescapable issue: Either Chobert did not park behind Faulkner’s patrol car as he claimed in sworn trial testimony or police removed his car less than 20 minutes after arriving on the scene and before investigators and a department photographer had gotten there … an action constituting illegal tampering with the crime scene. Further raising questions about whether Chobert was actually where he claimed to have been during the shooting, a diagram of the crime scene drawn by Cynthia White, plus a second one drawn by a police artist following her instructions, show no taxi, though they do show, in front of Cook’s VW, the extraneous detail of a Ford sedan that played no role at all in the case. No other witness at the trial except for White ever testified to having seen Chobert’s taxi. Furthermore, if Chobert had witnessed the shooting while sitting at the wheel of his cab behind Faulkner’s squad car, as he testified, his view of the shooting, which took place on the sidewalk on the driver’s side of the parked cars, would have been blocked by both Faulkner’s and Cook’s parked vehicles. Making his alleged view even more problematic, it was dark at the time, Faulkner’s tail lights were on and his glare-producing dome lights were flashing brightly. As for Cynthia White, though she claimed to have been standing on the sidewalk by the intersection of 13th and Locust, just feet from the shooting, no witness at the trial, including Chobert, claimed to have seen her there. Furthermore, White’s story about the shooting changed dramatically over time, as she was repeatedly picked up for prostitution and, each time, was brought down to the Philadelphia Police Homicide Unit, where she was questioned again and again about what she had seen. In her first interview with detectives, she said she saw Abu-Jamal shoot the officer several times before Faulkner fell to the ground. A week later, she said it had been one or two shots that were fired before the officer fell to the ground. A month later, in January 1982, she was talking about only one shot being fired before Faulkner was on the ground – the version of her account that she eventually presented at trial. Given the already problematic nature of both Chobert’s and White’s sworn testimony, this new gun test evidence demonstrating that there certainly should have been obvious bullet marks located around Faulkner’s body if, as both these “eye-witnesses” testified under oath, he had been fired at repeatedly at point blank range by a shooter straddling Faulkner’s prone body, the whole prosecution story of an execution-style slaying of the officer by Abu-Jamal would appear to be a prosecution fabrication, complete with coached, perjured witnesses, undermining the integrity and fairness of the entire trial, as well as the subsequent death sentence. The whole prosecution story of an execution-style slaying of the officer by Abu-Jamal would appear to be a prosecution fabrication, complete with coached, perjured witnesses, undermining the integrity and fairness of the entire trial, as well as the subsequent death sentence. Courts – federal and state – have over the years rejected all evidentiary challenges and all but one procedural error in the Abu-Jamal case, despite granting legal relief on the same issues as those raised by Abu-Jamal in dozens of other Pennsylvania murder cases – including a few cases involving the murder of police officers. The Abu-Jamal case, which has garnered international attention, is currently back before the federal 3rd Circuit Court of Appeals after a remand order by the U.S. Supreme Court to re-examine an earlier ruling eliminating Abu-Jamal’s death penalty. It is also back in the news with two new documentary films premiered Sept. 21 in Philadelphia – one, “The Barrel of a Gun,” which concludes Abu-Jamal is guilty, and another, “Justice on Trial: The Case of Mumia Abu-Jamal,” which argues his innocence. Dave Lindorff is the author of “Killing Time” (Common Courage Press, 2003), the definitive independent book about the case of Mumia Abu-Jamal, and Philadelphia journalist Linn Washington has tirelessly investigated the case since December 1981. This story and photos originally appeared in This Can’t Be Happening, http://www.thiscantbehappening.net/node/214. It appears that the Police needed those "missed shots" to account for the spent chamber in Jamal's gun. My question is, why. If for instance, he shot the officer and even fired the other rounds into the air, they still have a case, why risk a mistrial with an unnecessary lie? Now where are those bullets, now that we have seen they were not fired in that pavement. It's looking like the gun they have is not the gun, and they needed to make it "The (smoking) Gun"